Two British Labour Party MPs have written to Foreign Secretary calling for the withdrawal of the diplomatic papers and expulsion of Sri Lanka’s Defence Attaché in London, Brigadier Priyanka Fernando, over his “attempt to intimidate” a group of protesting Tamils. Joan Ryan, the Labour MP for Enfield North and a Vice Chair of All Party Parliamentary Group for Tamils, and Siobhain McDonagh, Labour MP for Mitcham and Morden and Senior Vice Chair of APPG for Tamils, have sent a joint letter to Britain’s Secretary of State for Foreign and Commonwealth Affairs, Boris Johnson. They express serious concerns regarding the conduct of Brigadier Fernando, the Defence Attaché to the Sri Lankan High Commission in London. The letter states that members from the Tamil community congregated peacefully outside the Sri Lankan High Commission in London, to protest the alleged “on-going persecution of Tamils” on Sunday (4), as Sri Lanka marked the 70th anniversary of independence from British rule. “This is inappropriate, unacceptable and threatening behaviour, from someone who is serving in an official capacity as a guest of this country,” the letter said. 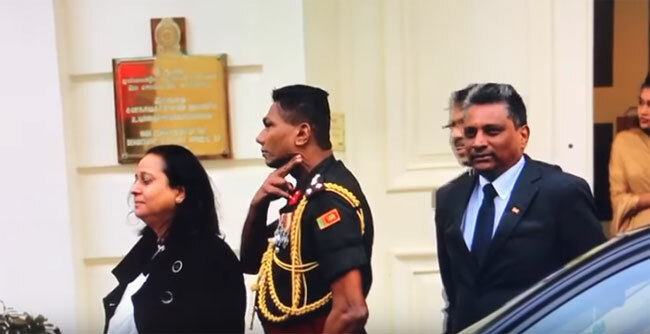 The Labour MPs urged the British Foreign Secretary to make immediate representations to Sri Lanka’s High Commissioner about this matter and also requested that he withdraw Brigadier Priyanka Fernando’s diplomatic papers and expel him.